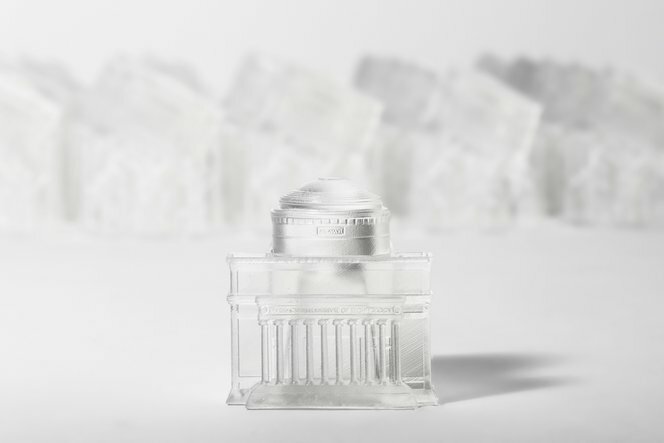 Formlabs partnered with the MIT Alumni Association to produce a unique gift for guests at a recognition dinner held in Boston. Here's a little insight as to what goes into printing 120 custom models of the MIT Dome just a few weeks before an event. Since we couldn't get our hands on a high-resolution 3D model of the iconic MIT Dome, we turned to Formlabs modeling fiend, Brian Allan, to create one. Using online images for guidance, Brian built a model in Solidworks and printed a few variations to review with the MIT team. Then, we picked a final design and finished up the model, even adding tiny protruding text to take advantage of the high-resolution possible with the Form 1+. With a finished design, it was time to optimize the 3D model for batch printing. The model was scaled so that we could fit four parts onto a platform at a time. We tried a few different orientations and custom support structures as test prints. From those, an orientation was chosen that produced a great print while minimizing the amount of support cleanup each dome required, and the final .form file was shared. With 5 printers cranking out builds every day for two weeks, we were able to print 120 perfect domes at 50 microns. The night before the event, the supports were carefully removed, the back walls were sanded and a final coat of mineral oil was applied. Each dome cost around $4.00 in material to print. Creating a custom 3D printed gift can add a real differentiator to your event and presents a great opportunity for branding and promotion. All the guests loved their 3D print and how the organizers had mixed new technology with the group’s tradition.